Occasionally I am blessed with the opportunity to work with a brand who gives me a good amount of creative freedom. City Kid Style is one such brand. 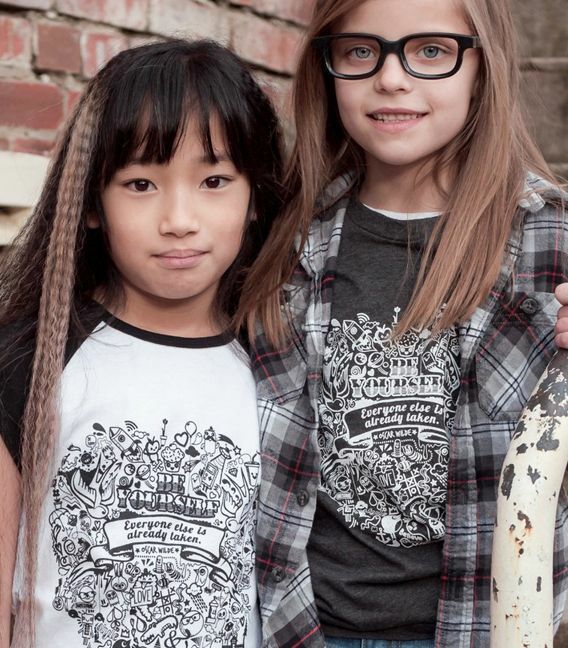 This unique boutique store offers printed “basics” and unique one of a kind hand made kids clothing. The brain child of a Washington mom with a local, sustainable and American made message, this brand has a great products. I was commissioned to create a tee centered around a well know Oscar Wilde quote. The brief was loose and afforded me the luxury of letting the design unfold organically. I tried to represent the young kids who would wear this tee with characters, words and positive energy that reflected the spirit of the brand. A mass of characters and doodles developed into a unique slightly heart shaped composition. Happiness, Education, Home and Friendship were all represented in a fun and unique way. My work allows me to work with giant brands and smaller boutique companies like City Kid Style. One thing is for sure it always feels good to support a small business lead by people with passion and a dream. We should all support our local, creative and sustainable businesses, it’s in all of our interests. Take the time to support this brand and pick up one of their tees here.